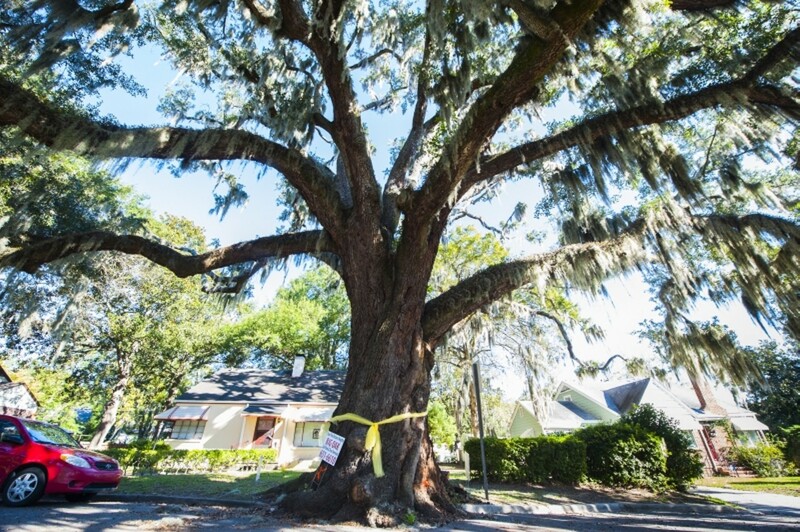 The giant live oak on E. 41st Street has seen its last days in spite of neighborhood protest. LONG BEFORE most of modern Savannah was even paved, a magnificent live oak has presided over the easternmost end of 41st Street. Estimated to be anywhere from 170 to 250 years old, the tree has a diameter of seven feet and a leafy canopy that spreads almost 16 yards. Its gnarled roots have pushed through the pavement, its branches dapple sunlight over half the block. It is believed to be one of the few dozen arboreal survivors of the 1895 Sea Island Hurricane that left Savannah’s landscape almost completely denuded. As far as icons go, the Victory Heights “Big Oak” is an exemplary representation of Savannah’s famous urban forest, both in its grandeur and its inevitable slow deterioration. But to Dr. Felix Maher the old oak is more than a symbol; it’s a friend. He and his two brothers grew up frolicking under it, and all them still live nearby. Early last month, he saw an ominous orange sign posted by the City’s Park and Tree Department on the tree’s trunk accompanied by a large, red “X.” His old companion was on the chopping block, and he wasn’t going to let it go without a fight—or at least a second opinion. The Park and Tree report indicated extensive rot and termite damage and called for a full removal of the tree, including the stump. Worried that the diagnosis of unsalvageable decay was premature, Maher spearheaded a vocal campaign to save the tree, or at least extend its life. He and neighbors flooded the City with requests for a stay of execution. “I think the city is more worried about lawsuits than they are the tree,” Maher said at a neighborhood meeting in October, referring to last year’s $9.5 million settlement paid to Shanta Greene, who lost her right leg and sustained a brain injury after a tree branch fell on her in 2010. He invited UGA Extension Agent David Linvill out to survey the tree and paid independent arborist Michael Pavlis of Ossabaw Consulting to do another examination. Linvill didn’t offer any definitive recommendations, but Pavlis came to the same conclusion as the city: That the Big Oak presents a significant hazard and needs to come down. “The massive amount of decay on the lower trunk and the potential to damage multiple homes are the driving reasons for the removal of this tree,” wrote Pavlis in his Oct. 20 report. Now convinced of the old oak’s unavoidable fate, Maher still chafes at the unceremonious way it was handled. “I think oak trees of prominence in Savannah neighborhoods and the citizens deserve more than a red tag and spray painted X,” he laments. In response to concerns that the City is preemptively taking down trees to avoid litigation, Park and Tree Director Jerry Flemming explains that the increase in live oak removals is simple, though no less tragic. “Trees are living, and they all die, eventually,” he gently reminds. Flemming, an International Society Arboriculture-certified arborist, says he’s found the old wives’ tale that dictates oaks grow for a hundred years, live for a hundred years and die for a hundred years to be true—give or take a couple of decades. He points out that most of Savannah’s live oaks were planted between 1898 and 1923 to fill in the bare spaces left by the catastrophic1985 hurricane, and many of those have reached their full maturity. “A hundred years on the street, surrounded by concrete, that’s a pretty great life for a tree,” he says, explaining that the root systems of most urban oaks are impeded from a full 300 life span by pavement, sewer lines and constant traffic. He is sympathetic to Maher’s concerns about the removal of the 41st St. oak and promises that while public safety is always a priority, Park and Tree’s arborists wouldn’t cut down a tree unnecessarily. “We prune far more trees than we remove. 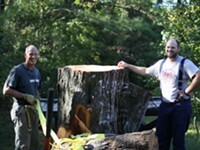 But sometimes a tree just has to come down,” Flemming says. At the City’s budget retreat last week, it was announced that Flemming is leaving his position next month and has accepted a city manager position in Iowa Park, TX. 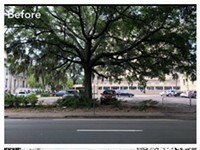 The tree removal is scheduled for Nov. 18 and is expected to take three days. According to the most recent analysis, live oaks make up around 17 percent of Savannah’s urban forest and are its most abundant species (crape myrtles come in second at 15 percent.) 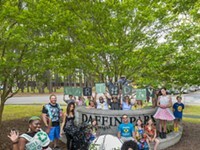 Around 66,000 trees from 250 species have been inventoried by the City, and over 1000 new trees are planted each year by Park and Tree and the Savannah Tree Foundation. Savannah Tree Foundation executive director Karen Jenkins believes there is underutilized potential in the fallen giants and would like to see more of Savannah’s dying trees put to use instead of mulched at the landfill. “As trees come down for public safety, we should be reclaiming that usable wood,” muses Jenkins. This summer STF hosted a lecture about the 1797 warship U.S.S. Constitution. 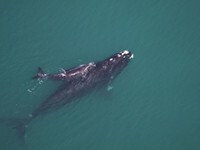 Known as “Old Ironsides,” it was built with wood from live oaks felled near Savannah and is still in commission today. Maher plans to put aside wood from the Big Oak and hopes his old friend will be repurposed by local craftsmen. Flemming says Park and Tree will honor the request to replace the Big Oak with another live oak sapling, planted in the same cutout that has calmed traffic for decades. 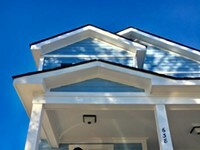 He reiterates that he understands the neighbors’ grief, and that sometimes cutting down a dying tree is the most merciful option. “The trees deserve our respect. We also don’t want dead skeletons standing around,” he says.